As some of you already know we don't allow sugar drinks (Gatorade, Powerade, etc.) on the field during practice and games. One reason is the AMHS will not allow it but, mostly it’s the worst thing you could possibly put in your body. Why? It’s made up of mostly chemically treated & refined sugars (as much as a typical soda), artificial colors, and other ingredients that are just not good for the body. But with that said, we also understand that during practice and games an athletes can lose water and important energy components that keep them hydrated and functional. Here are some tips to help keep your athlete hydrated and get ALL the electrolytes they will ever need. Having your child drink a glass of water or two (Depending on the size of your child) an hour before coming to practice or a game is a great way to hydrate. Also eating water concentrated foods such as apples, oranges, celery, tomatoes, or a nice salad is a great way to get water and vitamins into an athlete. Muscle cramps – After a practice your athlete may have leg or some other sort of muscle cramps. The general reason for this happening is overexertion and dehydration (WATER, WATER, and WATER). This can lead to an electrolyte (that word again) imbalance. This means your body is missing some ingredients (Sodium, Potassium, Magnesium, Calcium, etc). Bananas are a good source of potassium but, if you REALLY wanted to bump up the Potassium here are some options in order (White beans, Spinach, Baked Potatoes, Dried Apricots, Baked Acorn Squash, Yogurt (plain, skim/Non-fat), Fish (Salmon), Avocados, White Mushrooms). Juice Celery + Apple + Lemon - This juice combination works wonders for replacement of electrolytes. The celery has a natural source of sodium, potassium, magnesium, chloride, and phosphorus. Apple provides additional potassium and natural sweetness. Lemon is the highest electrolyte containing citrus fruit. Stir Sea Salt + Baking Soda + Lemon Juice + Maple Syrup into 8 ounces of Water – This is a great natural remedy for serious endurance athletes – You might think drinking baking soda is a little weird, but it’s been used for centuries to treat various ailments. In this case, it’s added to the mix because it makes the body less acidic and provides an additional source of sodium bicarbonate. 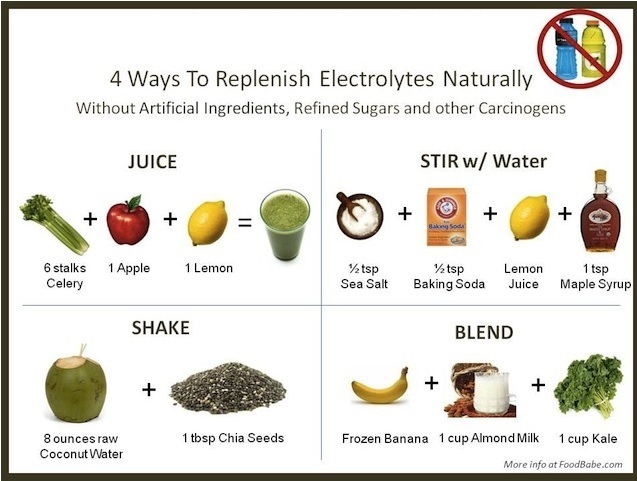 Shake Raw Coconut Water + Chia Seeds - Raw coconut water has a ton of electrolytes and potassium that will not only help you stay hydrated but, also keep your body from getting any cramps. It is completely natural and very low in sugar. Combine this with a packet of chia seeds and you have a 1-2 punch! Chia seeds are an incredible energy food – full of omega 3 fatty acids, protein, and fiber. These seeds have the ability to keep you from getting dehydrated because of they can hold 9 times their weight in water! There are travel packs available that don’t need refrigeration either – perfect for just throwing in your gym bag or purse. Blend Frozen Banana + Almond Milk + Kale – This smoothie is extremely hydrating. The banana provides a good source of potassium and magnesium which help regulate your fluid stores. Almonds are extremely rich in magnesium and potassium. When you make your almond milk, make sure you add sea salt (store bought almond milk already has salt added to it). Kale is a superfood and another excellent source of magnesium and calcium.